Five Green Consumers you need to know. Being a creative guy, I naturally wanted to get in the category naming game too. So here they are, the Green Briefs Big 5. From greenest to grossest. Out there on the green fringe, are the Righteous And Willing Nature Unspoiling Total Zealots, or RAW NUTZ. This group is the politically-active minority who are on the edge of eco-innovation. They could be valuable to consider for ‘deep green’ niche products, although resistance to consumerism and marketing may make them a tough sell. This group is not easy to reach with traditional media or messaging. Yet all green marketers should keep the RAW NUTZ in mind, because they do their research, and they are trend-setters. They are also the letter-writers who may call ‘greenwash’ on your eco-marketing claims, whether they use your product or not. The next most eco-conscious group are the Hopeful Eco Ranting Buyers, or HERBs. They buy into new ideas and technology quite easily, may be more tolerant of performance or cost issues and may be willing to spend more for green products because they believe they are making a difference. This is a highly valuable group because they still enjoy their lifestyle and a certain amount of healthy consumerism. They want to be seen as eco-friendly, demand visible eco-performance and are willing to pay for it. The MOSS, or Masses of Sustainable Starters, are a group characterized by a fairly high interest in green solutions, yet a reluctance to overly change their lifestyles. They tend to more equally balance economic and environmental factors in their decision-making, and need their eco-friendly products to perform as well or better than conventional products. More and more people seem to be joining the MOSS, and this group will be a main target as green products and services become more mainstream. A creative message that might motivate the MOSS would be one that would encourage environmentally-conscious behaviour, yet not in a threatening way. A message that would imply that eco-friendly choices can be made with minimal sacrifice. The WEEDs, or Waiting For Everybody Else Demographic, are a more slowly-evolving majority. They are more on the fence when it comes to the environment and are reluctant to embrace newer technology and solutions. For them a claim of ‘eco-friendly’ might be an influencing factor in a purchase decision only if all other things were equal. 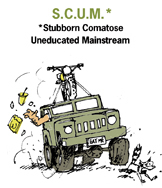 And finally, The Stubborn, Comatose, Undereducated Mainstream. The SCUM. This group do not believe environmental concerns apply to them. They may not even believe the planet is in any trouble at all. They are more likely to purchase automobiles for their speed, off-road capability or towing power, whether or not they actually ever tow anything. They watch wrestling, and think it is real. Naturally, the studies in question do go into much greater detail, and each has nuances that may be valuable for certain marketers. But as a savvy brand manager you can probably create your own five-category green consumer segmentation and save your research dollars to go deeper on your specific customer base. Previous: « Humour: When to use it for Green Motivation? Very good read. You have done a really nice job and maintained some personality which is a nice trait of the blogisphere! Pingback: A little light green reading.